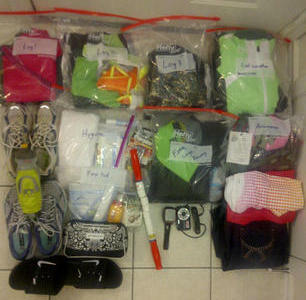 I fly out tomorrow for Hood To Coast so I thought I’d give you a peek into my packing. 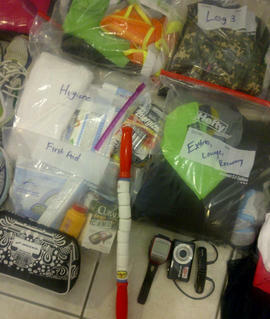 When I got picked for the nuun team everyone started giving me packing tips. The one I received most often was: pack everything in ziploc bags. 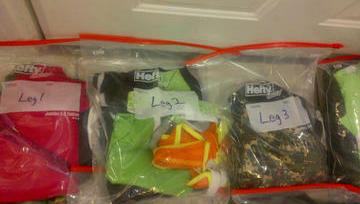 So I’ve packed clothing for each leg in its own ziploc. I’ll open it up, get dressed, run and then when I get back to the van I can take those stinky clothes of and seal them up in that ziploc. You can’t tell from the pictures,but each of those “leg bags” as I’ve been calling them has a dryer sheet in it as well. The only thing not pictured is my phone w/charger and then I’m undecided on a pillow. If I have room I may pack a small one, if not I’ll wing it. Thankfully Mel is letting me borrow a sleeping bag, so I wont have to fly with one. We’ll also have some nuun gear when we get up there, so I tried not to pack too many extra tops. Ok people, what am I missing? What do I need?